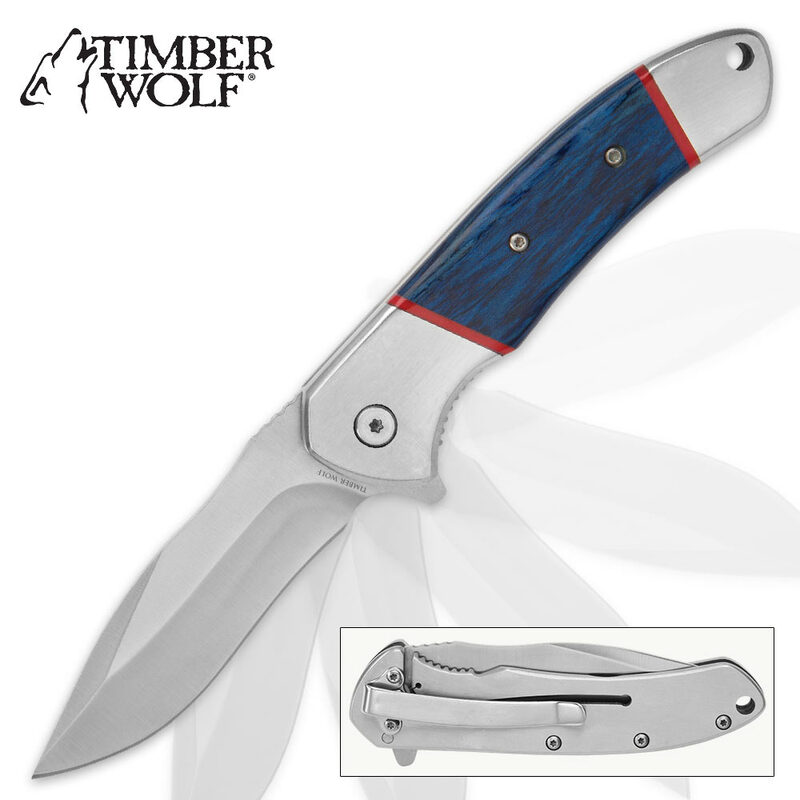 Timber Wolf Riverscape Assisted Opening Pocket Knife | BUDK.com - Knives & Swords At The Lowest Prices! One of the best values on the knife market today, Timber Wolf's Riverscape Pocket Knife boasts a stout feel, solid construction, classic form and smooth, near-instant blade deployment that's unmatched by knives at two and even three times its price! Its tough 3 1/8" drop point blade is forged from resilient 3Cr13 stainless steel and features sleek lines and a fine edge that's razor sharp right out of the box. Just nudge the handy flipper, and the stately blade opens in the blink of an eye, thanks to the velvety smooth assisted opening mechanism. The Riverscape makes quick work of even the most demanding cutting tasks, and the sturdy liner lock keeps the blade fixed safely in the open position while performing vigorous work. More than just a utilitarian workhorse, the Riverscape boasts ample beauty to accompany its undeniable brawn. 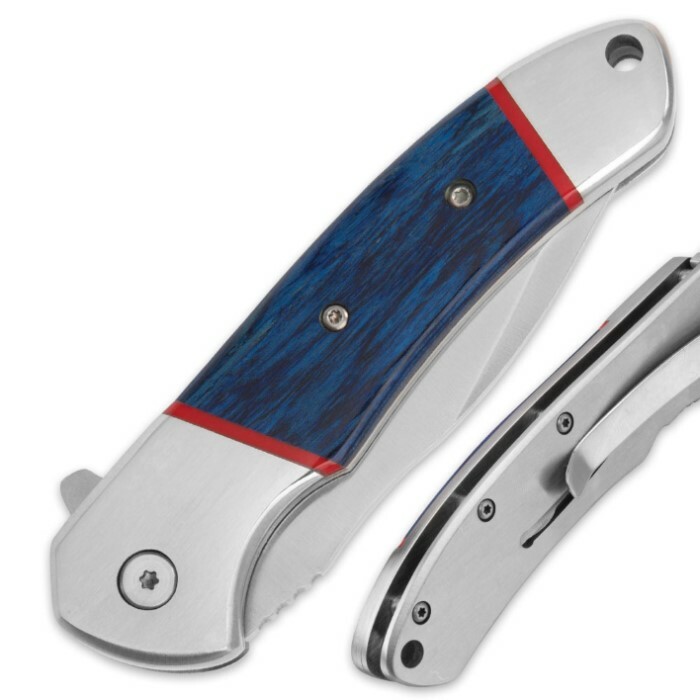 Durable pakkawood handle scales stained a charming azure blue gracefully offset the tastefully simple stainless steel bolsters. Delicately sanded and polished, the handle affords an outstanding hand-feel; add the Riverscape's impeccable balance and superb weight, and the result is a knife wielding experience that's second to none. At 4 3/8" closed, the Riverscape is versatile and well suited to a range of tasks. Its moderate size also makes it easy to carry everyday, especially with the added convenience of the integrated pocket clip and lanyard hole. 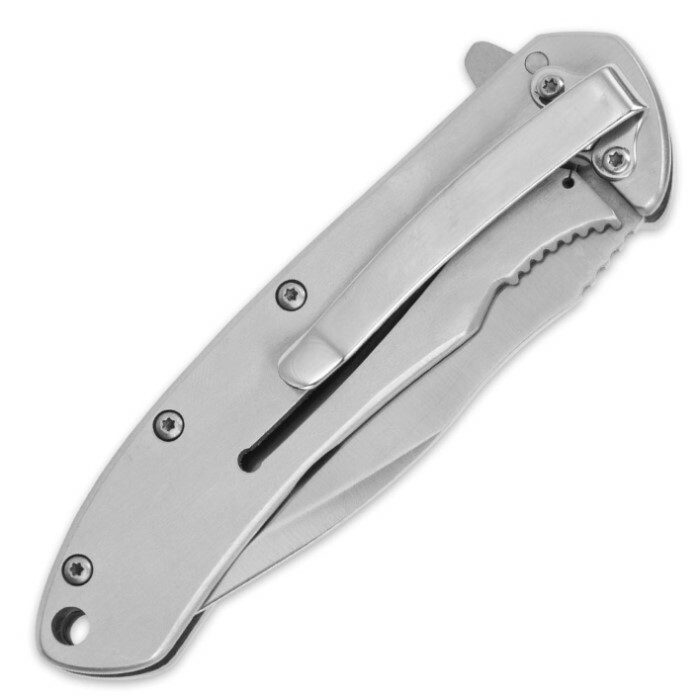 Timber Wolf's Riverscape Assisted Opening Pocket Knife is a remarkable all-around folder, and best of all, it's surprisingly affordable! At this price, you can add the Riverscape's sister folders - the "Cloudscape" and "Prairiescape" (both sold separately) - without breaking the bank! Show them off in a collection, carry all three or keep one and gift two! You simply can't go wrong with Timber Wolf knives!